Glitter Heat transfer vinyl (i.e. T-shirt vinyl, Iron-on vinyl) comes with a heat activated adhesive on one side. The other side (which will be the exposed side upon application has a clear carrier sheet that provides a way to keep everything intact until application. All cuts will need to be mirrored (flipped) as you are cutting it from the reverse side. Easyweed heat transfer vinyl is compatible with all personal hobby and craft cutters and can be used in many applications including shirts, hats, shoes, bags or most anything that can withstand the application temperature. Features Application: Preheat 3 seconds, Apply firm pressure at 325°F for 10-15 seconds Peel: Hot Layering: Only as top layer Adheres to: Cotton, Uncoated Polyester, Cotton/Poly Blend Finish: Glitter Thickness: 12 mil Recommended Wash Instructions: inside out and hang dry Compatible with all craft cutters such as: Cricut, Silhouette, Xyron, Craft ROBO, Graphtec, Quickutz, Inspirations, Pazzles, etc. 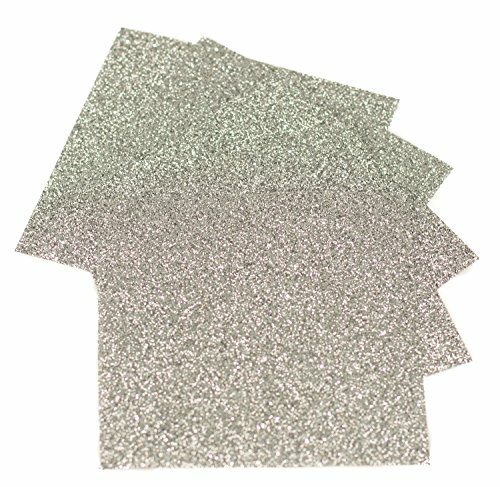 5 Sheets of 9"x12"(+/- 0.5") of Siser Glitter Heat Transfer Vinyl (AKA T-shirt vinyl). Siser's new Glitter line of heat transfer vinyl is the perfect material to add a little sparkle to your apparel! Glitter is CPSIA Certified so that even kids clothing can look amazing. Siser's glitter material peels HOT so you can get the job done quicker. Expressions Vinyl's custom packaging provides step-by-step full color instructions! If you have any questions about this product by Expressions Vinyl, contact us by completing and submitting the form below. If you are looking for a specif part number, please include it with your message.